Back Road Momma: Getting your pool ready? Ahhhh… That moment when you realize it’s finally time to actually open up the pool so you can enjoy the refreshing water all summer long. But wait, there’s a lot of work into opening the pool including all the cleaning and chemical testing. A few years ago we switched to a Salt Generated Chlorine Pool and I love it! It was the best choice we had ever made. 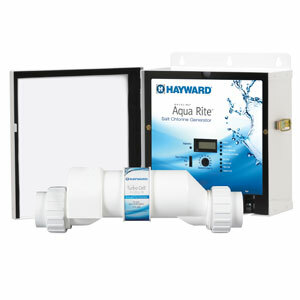 I ordered the Hayward Aqua-Rite Chlorine Generator from InTheSwim.com and have been a lifetime customer ever since. The generator automatically senses the pools chemical components to let you know what you need to add and with a touch of a button you can increase the chlorine flow. That feature is great for the days we have 15 or 20 people swimming. My favorite and most used feature though is it tells me exactly what the temperature of the water is before I jump in! What we spent on the Hayward Aqua-Rite Chlorine Generator was about half of what we were spending in chemicals for the summer, so this for us was a very amazing purchase! Another order from Intheswim.com this year is the very new SaltDip Digital Pool Chemistry Tester. This little gadget is so easy to use and it even comes with the batteries. The large LCD Screen and the two simple buttons make it really easy to use. 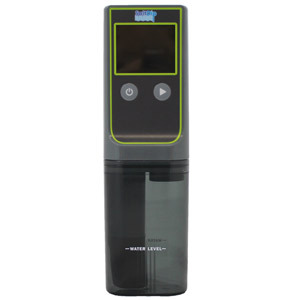 The tester measures not only the salt content but the total dissolved solids and the water temperature in one easy spot. There is never any calibration needed so even I can use it. I love this thing especially compared to the old colored dip sticks that you really had to guess and compare because this is easy as the numbers are very simply displayed. Another great feature and one I have been taking advantage of is the memory function because it stores the previous measurement. This made it really easy to tell if we were making progress or not. So... to all my friends and family, the pool is almost ready. According the the SaltDip we needed to add two more bags of salt this year and we did that last night. Everything should be ready to go in a few days, so come swim! I heard from a friend who heard from a friend... It was really the best decision we ever made. So far this year we have spent about $25 and I don't expect to spend much more. It's awsome!!! I had no clue you could actually convert your pool to a Salt Generated Chlorine Pool, that is freaking awesome! Where can we go to see what pool toys they offer? Check out InTheSwim.com they have so many different pool products! As soon as I get some toys I will be sure to let you all know. Their products are awsome! Is Salt really that much cheaper? The generators look kinda high, but I guess we do spend at least that each summer anyways... I have to talk to hubby about this, we really need to do something! This looks great! I've never heard of this store and I always have to drive across town for the stuff I need. Thanks for sharing, I will be visiting often! I love InTheSwim! We order just about everything from them unless its a "impulse purchase". I love our salt pool!! But also never used Intheswim.... So I took a look at their website and it was a lot cheaper than my pool store! Switching! Glad you love your's as much as we love ours! Check them out, they are my "go to" place! my Mom has a salt water pool and boy does it make a difference! It doesn't burn your eyes as much and the water just feels different to! This sound like a nice product and since i do not have a pool i have never heard of this. Great review and i shall pass on to those that do have a pool. This is very cool! My hubs would love it (he takes care of our pool LOL). It's really the best way to go...saves money and it's healthier too! Yes! I think the salt is part of a detox system but I'm gonna have to look that up. Maybe a future post! Yes! Amazing we love it! Love this! If we ever get a pool I will need this! don't have a pool but a friend could really use this. Every neighbor kid would come to her house in the last few days of school and the whole summer. I totally want the SaltDip!! I would love to switch to salt by the end of summer! This is important for the effective removal of organic waste through the filter. pondmaster aquarium In the past few years, swimming pool pumps and motors have been part of a huge electricity-saving improvement effort.